John Volk didn’t know what to expect when his seven-year-old came home from school carrying a Cub Scouting flyer. He had never been a Scout, and didn’t really know anything about the program. He just knew that his son wanted to get involved. At his first Pack meeting, the Cubmaster asked John Volk to become a Tiger Den Leader. John accepted without knowing exactly what it entailed and went to the Scout Shop to buy a uniform. 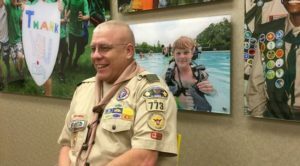 Within six months of joining Scouting John attended Wood Badge. “Our Cubmaster just made it sound like the thing you do…” he says. It was during that course that he saw the bigger picture of what Scouting could do for his sons. After that initial shock, John’s sons became heavily involved in Scouting. They rose in leadership positions within their Troop, attended NYLT and NAYLE and both earned the rank of Eagle Scout. They now remain active as Venturers. John volunteered at the Unit and District level throughout his sons’ Scouting career and made friends with other volunteers, leaders and parents. “You meet the best people,” he says of his fellow Scouting volunteers. He has no plans of stopping either. Now that both of his sons are Eagle Scouts, John Volk serves as the District Chair for the Pickett’s Mill District and continues to serve as the Committee Chair of his sons’ Troop. John Volk is the District Chair of the Pickett’s Mill District and the Committee Chair of Troop 773. He is the father of two Eagle Scouts. Tagged Cub Scouts, NYLT. Bookmark the permalink.